Just like the real 36th president of the United States, animatronic LBJ amuses visitors with jokes and stories. President Lyndon Baines Johnson was known for his stories and his sense of humor. At the LBJ Presidential Library and Museum in Austin, Texas, an animatronic version of the 36th U.S. president continues his legacy, spinning tales and reciting jokes for adoring visitors. This talking, gesturing robotic President Johnson is a highlight of the library. 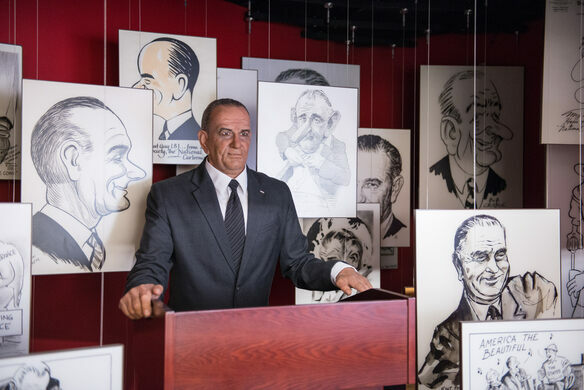 Animatronic LBJ was originally created for Neiman Marcus’s 90th anniversary celebration at its flagship store in Dallas. Dressed in casual ranch clothes for that display, including a checkered shirt and a Stetson, he originally sat in a pickup truck in front of a ranch backdrop. That was in 1997. When the celebration was over, Neiman Marcus donated the object to his namesake’s presidential library. He was adjusted into a standing position for his new home, originally made to lean on a white corral fence, from which he recounted stories just like the real LBJ. In fact, actual recordings of the former president were used in the attraction. Visitors loved it. 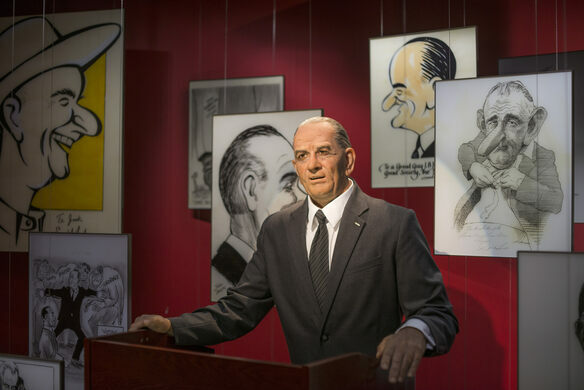 When the library underwent renovations in 2012, the animatronic LBJ was revamped again. This time, he was put in a suit and tie, made to look more like he had during his presidential years, and was given movement in his arms and shoulders so that he could gesture as he was speaking. Robot LPJ was put behind a lectern to tell his tales and jokes, more accurately representing how the president would have appeared when he told the recorded stories. Behind him, an assortment of caricatures and political cartoons are hung from the ceiling. The exhibit is called LBJ Humor. The only place for a truly presidential dram.